From the Academy's Web site: On Oct. 16, members of the Academy performed in and around Cardinals Stadium and as part of the pre-game for the NFL's Monday Night Football match up. The Chicago Bears edged the Arizona Cardinals by one point in a fourth quarter comeback victory. The Cardinals led 23-3 through the third quarter. Academy Executive Director Mark Richardson said about being part of the game-day excitement: "It was amazing to be there. The game was very similar to the Rose Bowl I went to when Arizona State took on Ohio State—a huge swing in emotions in a short period of time." 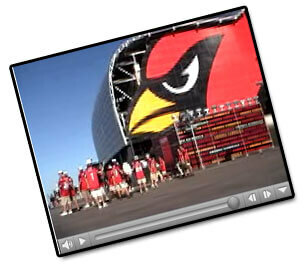 Check out a video montage of the drum line's performances at the game on www.arizonaacademy.com.